Just a few days ago we reported on Radeon RX 560M listed at Lenovo website. 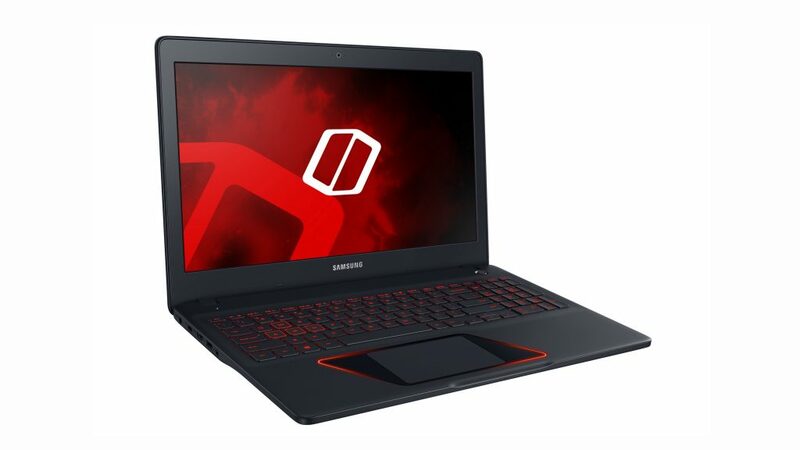 Today we report on another Radeon RX 500 card, but this time in Samsung laptop. Samsung Odyssey (17.3in version) will be available with GeForce GTX 1070 or Radeon RX 570 on board. 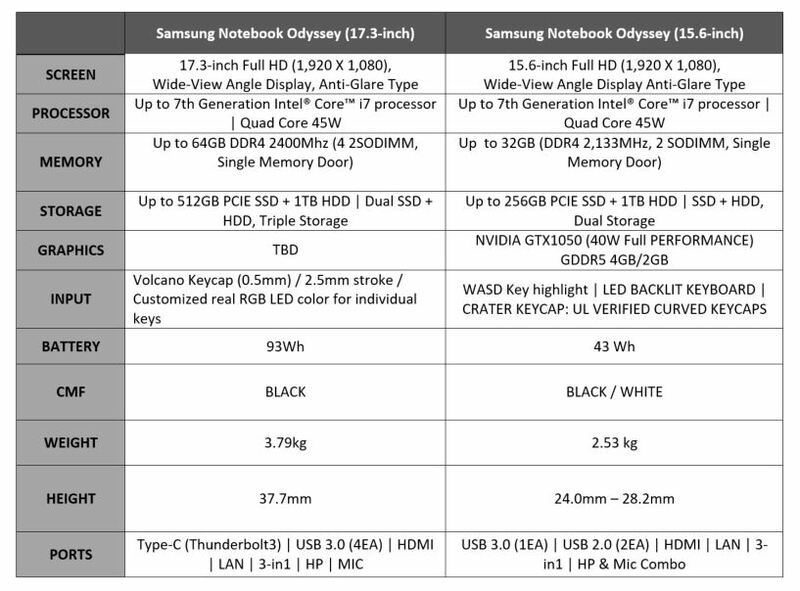 Just two days ago Samsung released specs of its new Odyssey series, except for the fact that GPU section was marked as ‘to be determined’ (looked like this). 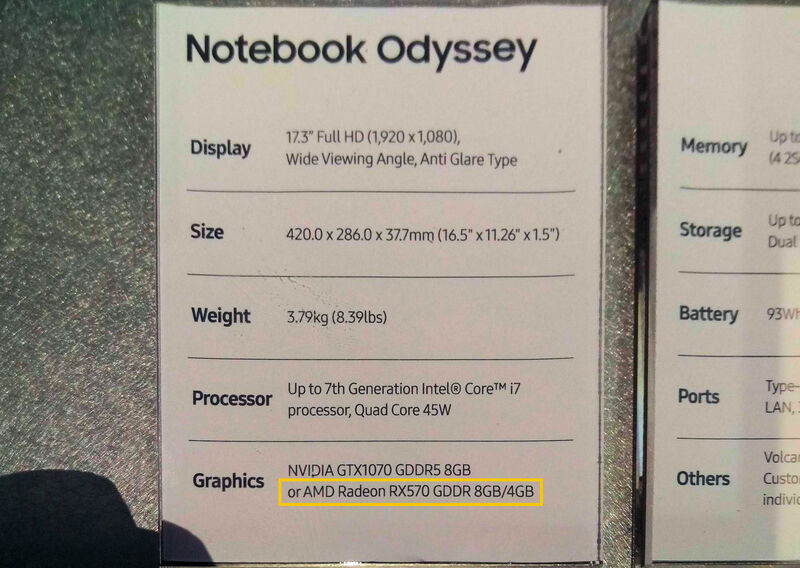 The specs sheet at Samsung’s CES2017 booth apparently has more information than a public press release, as it reveals that Odyssey will ship with either GTX1070 or RX 570. It also reveals that Radeon RX 570 will be available in two variants: 8GB and 4GB. It’s too early to say if RX 570 is based on a new chip, but so far we found no reason to believe that notebook RX 500 series are not rebranded from RX 400 series (the only difference is that notebook RX 400 series could be found only in few devices). What also seems unclear is the postfix on RX 500 mobile series naming. The RX 560 had the ‘M’, meanwhile, RX 570 has none according to Samsung. For the time being, we are going to refer to it as RX 570M. Update: According to the source, AMD confirmed that Radeon 500 series are OEM rebrands of Radeon 400 series. At this time we are only talking about mobile graphics chips.